With many teams halfway through their season, the MVP field is starting to slim down. Just 16 names remain listed at Bovada, and only three of them have shorter than 10-1 odds to win the award. With a couple of players eating up most of the implied probability, will bettors look to find value down the list or invest in the favorites now before we see someone move into minus-money territory? Crazy to think that just two weeks ago Bovada moved Mahomes from +333 to +700. That was clearly picked on by bettors as he moved to +300 later that day. With four more touchdowns in a 30-23 win over Denver, Mahomes is now at even money to win the MVP. He leads the league with 26 touchdown passes and 2,526 passing yards, but is fourth in QB rating behind Drew Brees, Philip Rivers and the current leader at 119.3 … Ryan Fitzpatrick. 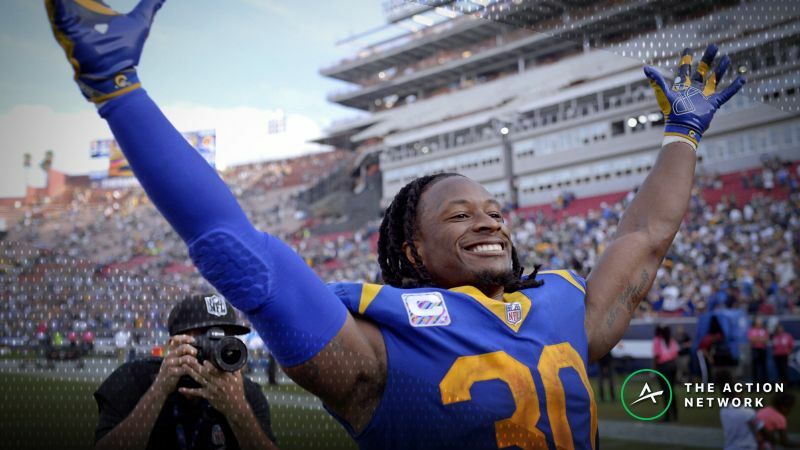 He-who must not be named ruined the lives of those with money riding on last Sunday’s Packers-Rams game, but Gurley had a great game nonetheless. The Rams running back had more than 100 yards on the ground, nearly 200 yards from scrimmage and found the end zone yet again, which he has done every game this year and 15 times total. You know who is currently on pace for 30 scores, which would be one short of LaDainian Tomlinson’s record. Considering Gurley’s individual success and the Rams’ team success, we could see the first non-QB MVP since Adrian Peterson back in 2012. This one is a bit surprising. Wentz had a good game in London, but the Eagles are just 4-4 on the year and 3-3 in his starts. Does he deserve better odds than Jared Goff, who is 8-0 and has a better QB rating than Wentz? Not in my mind. Wentz will have a new toy to play with in Golden Tate, but he would need to have one hell of a second half to pass some of the names above him on the list. Ah, the aforementioned Goff. I imagine his odds have fallen so much just because of Gurley’s dominance. Goff himself had a nice game against the Packers with just shy of 300 passing yards, three TDs and no picks, so those holding Goff MVP tickets are likely a bit surprised and disappointed to see this. It’s possible he gets some decent action at this price and his odds are readjusted later in the day as we saw with Mahomes a couple of weeks back. The Saints had a big win in Minnesota and scored 30 points, but Brees and the offense didn’t really do all that much. In fact, Brees threw for just 120 yards, the fewest he’s thrown for in a non-Week 17 game since 2004 when, as a member of the Chargers, Brees threw the ball just six times. A win vs. the Rams and some more Brees-esque numbers this weekend would go a long way toward his MVP case. Rodgers and the Packers put up a good fight in Los Angeles against the Rams, but fell just short. Who knows what Rodgers could have done if Ty Montgomery didn’t decide to commit treason. With half of the season still to play, I wouldn’t be shocked to see some Rodgers backers at this price. This article was originally posted on ActionNetwork.com by Mark Gallant. Sports Insights is part of The Action Network.